If you haven’t seen sports in 3-D then you better hurry because you’re time is running out. 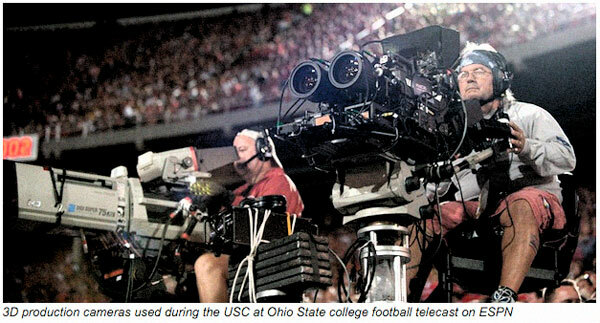 ESPN has decided to kill off their 3-D effort by the end of the year. Their reason, low adoption. In other words, no one watched. 3-D proponents made a lot of noise a few years ago, right around the time that the movie Avatar came out. While 3-D has found some traction on the big screen it hasn’t found much of any support on the small screen. There are a multitude of reason for why 3-D has not taken off on TV, in particularly for watching sports. From the price of the TV’s to the lack of content to the fact that you still have to wear glass among others. While 3-D may have failed (again) this gives folks like those at ESPN a chance to throw their resources in a different direction. The main direction should be to provide a really wide camera angle, especially when it comes to football. Give fans the same view that the coordinators get during the game and let fans really see how the play develops. This could go for other sports too. Imagine an aerial shot of the hole during the US Open with the weather information and instant tracking of the shot. A wide shot of a soccer match so you can see how the runs are developing during a match. There is plenty of room for sports broadcasters to make improvements that fans want. Who knows, they may even find that fans will pay extra for it. What fans are not going to do is buy an entirely new TV for a limited amount of content. It’s nice to see that someone like ESPN came to that conclusion.